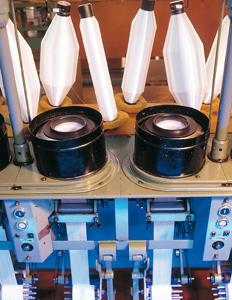 For the production of knit-de-knit yarns, also called bouclé yarns, polyamides are first knitted on a knitting machine. The resulting loop shape is then fixed by a steaming or dyeing process and unknitted again in the following production step. This kind of knit texturing remains unchanged even after undoing the tubular fabric. Knit-de-knit yarns are available in all colour shades which makes them a favourite for effect or fantasy yarns for distinct designs in trendy knitwear. Thanks to their high elasticity they also play a key role in medical applications.